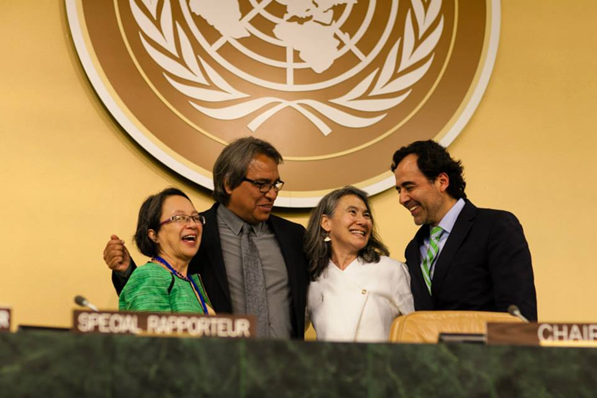 The United Nations Permanent Forum on Indigenous Issues (UNPFII) closed its yearly two-week session last Friday, May 23. 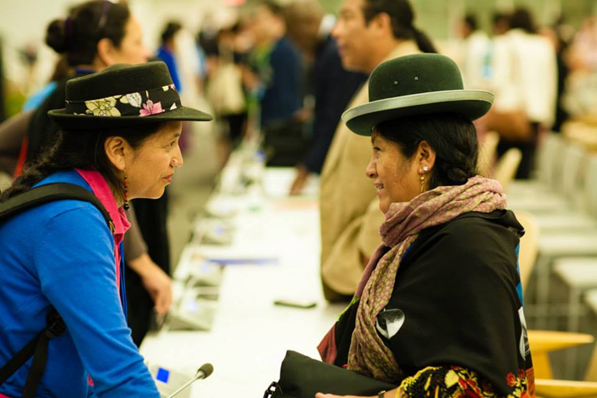 The agenda of the XIII Session of the UNPFII, included a number of important and delicate issues, from indigenous peoples' rights to the World Conference on Indigenous Peoples to be held in September 2014. As Technical Advisor/Coordinator for Indigenous and Tribal Issues, I represented IFAD both in official plenary sessions and side-events. Within the UNPFII and our partners, we reaffirmed IFAD's leading role as one of the UN organizations that has enhanced its focus on indigenous peoples' issues. In the official statement to the Plenary Session of the Forum, I concentrated on IFAD's strategy "to put indigenous peoples at the forefront of decision making for projects affecting their lives, and at all levels of IFAD's operations''. I also reminded that the IFAD's achievements are ''the results of genuine partnerships, based on mutual trust, with indigenous peoples and their organizations''. The statement was supported by a presentation delivered on IFAD's work in Asia, during a half-a-day session on the region. I informed the audience that IFAD currently invests about 1 billion dollars in 35 ongoing projects in support of indigenous communities in Asia, where an estimated 70 percent of the world's indigenous peoples live. I also informed about the 35 small projects financed through the Indigenous Peoples’ Assistance Facility (IPAF), considered as a model of community-driven development and participatory engagement. Most importantly, I stressed that these activities are carried out with the ''valuable partnership with representatives of indigenous peoples' organizations who have worked with us and the direct engagement of indigenous peoples' communities''. A great opportunity to reaffirm and strengthen IFAD's partnership with indigenous peoples has been the appointment of Ms Victoria-Tauli Corpuz - Executive Director of Tebtebba Foundation – as Special Rapporteur on the Right of Indigenous Peoples. A Filipina activist and expert , Vicky came to IFAD for the first time 11 years ago, to attend a side event of the IFAD Governing Council on indigenous peoples' rights. Since then she has been working closely with IFAD and UN organizations to bring indigenous issues and priorities into the mainstream of our work. Vicky importantly reminded that ''indigenous peoples need to step out of the paradigm of victimhood because we can provide sustainable solutions to the world's crises''. Equal participation and partnership between indigenous peoples, UN organizations, and governments was a much discussed theme during the Forum, in particular with reference to the first World Conference on Indigenous Peoples scheduled to take place in September this year. As confirmed in our statement on the World Conference, delivered in the second week of the Permanent Forum, IFAD has been supporting indigenous peoples in the preparation of the World Conference, approving a grant of about USD 1 million in partnership with the International Work Group for Indigenous Affairs (IWGIA) and the Global Coordinating Group (GCG) to cover travel and accommodation of indigenous peoples' representatives to preparatory meetings, as well as follow-up and policy engagement at country level. In line with several Governments and UN Agencies we called for the full and effective participation of indigenous peoples in the preparation and participation to the World Conference. Final decision of the President of the UN General Assembly on the modalities of the World Conference are yet to be released, however we trust that indigenous peoples will fully, effectively and equally participate in the World Conference processes. Alongside the formal discussions in the Plenary Sessions many side events and group meetings were organized during this XIII Session of the Permanent Forum. We were directly involved in the organization of three of them. One, led by the International Land Coalition (ILC) in cooperation with Asia Indigenous Peoples Pact (AIPP), Ogiek Peoples Development Programme (OPDP), SONIA Association, Convention on Biological Diversity (CBD), and El Centro para la Autonomía y Desarrollo de los Pueblos Indígenas (CADPI). The side event focused on Reviewing multi-source data and approaches for monitoring pressures over indigenous lands, territories and resources. The second, organized in partnership with United Nations Environment Programme (UNEP) and the International Union for the Conservation of Nature (IUNC), focused on pastoralism as a sustainable food system and practice preserving biodiversity and protecting ecosystems - countering the prejudice of pastoralism as being primitive and unproductive. The third, co-organized with the Asia Indigenous Peoples' Pact (AIPP) and Procasur concentrated on Procasur Learning Route in the Mekong region, and in particular on forest management and engagement with government and civil society. I chaired the event, welcoming among the participant Joan Carling, recently elected Member of the Permanent Forum and winner of the ''FIMI 2014 Leadership Award''. Highly significant – as well as successful - was also the launch of IWGIA Yearbook "The Indigenous World'', a comprehensive update on the current situation of indigenous peoples in more than 70 articles written by indigenous and non-indigenous scholars and activists. The Yearbook also concentrates on the path towards the World Conference and the Post 2015 Development Agenda. IWGIA and its work were praised by the newly elected Special Rapporteur for the ''enduring support to the indigenous movement without ever speaking on their behalf''. The XIII Session of the UNPFII has, thus, not only been an important platform for discussion between UN organizations, governments and indigenous representatives, but also a crucial site to strengthen partnership with and identify the priorities of indigenous peoples in view of the World Conference on Indigenous Peoples and of the IFAD's Indigenous Peoples’ Forum, whose second global meeting will take place in February 2015 in conjunction with IFAD Governing Council. I wish to thank Zac Bleicher and Sophie Ritchie from IFAD North-America Liaison Office for their great support. A special thanks to Michela Mossetto Carini, our intern in the Policy and Technical Advisory Division who self-sponsored her travel to the UNPFII Session and actively supported me.